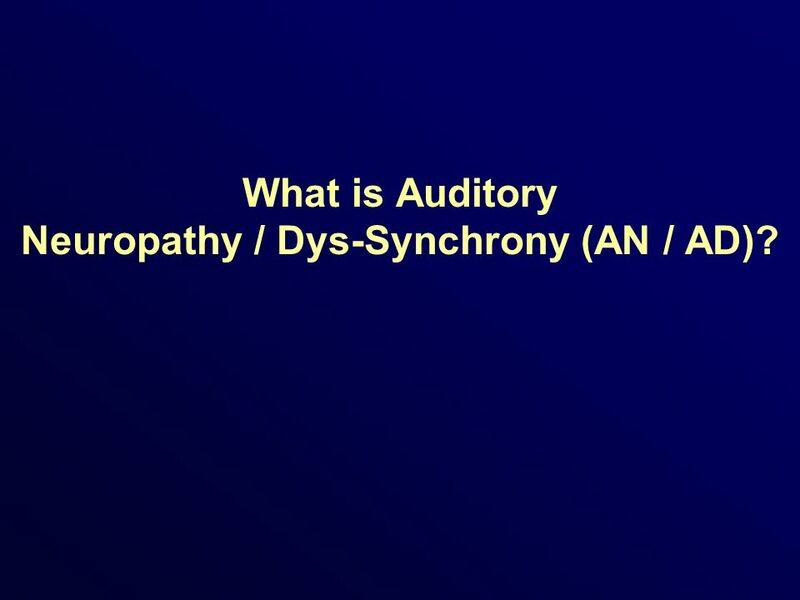 2 What is Auditory Neuropathy / Dys-Synchrony (AN / AD)? 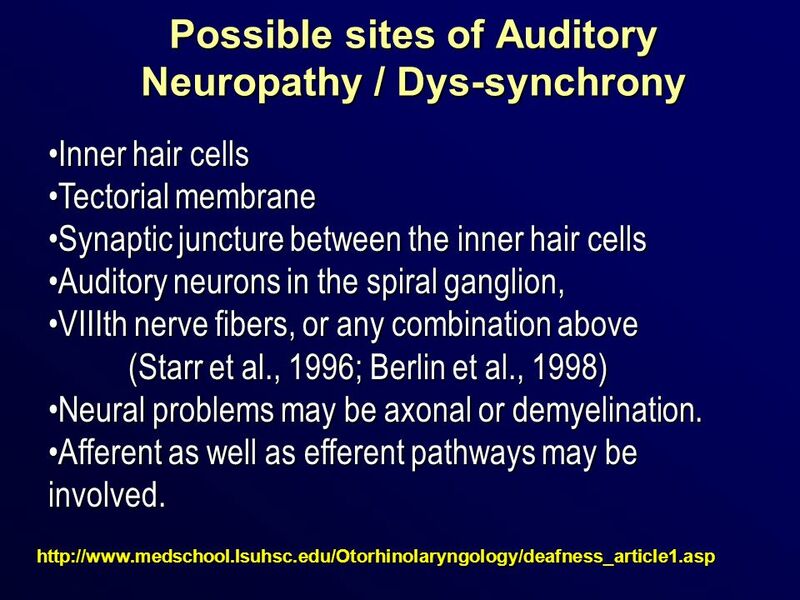 Inner hair cells Tectorial membrane Synaptic juncture between the inner hair cells Auditory neurons in the spiral ganglion, VIIIth nerve fibers, or any combination above (Starr et al., 1996; Berlin et al., 1998) Neural problems may be axonal or demyelination. 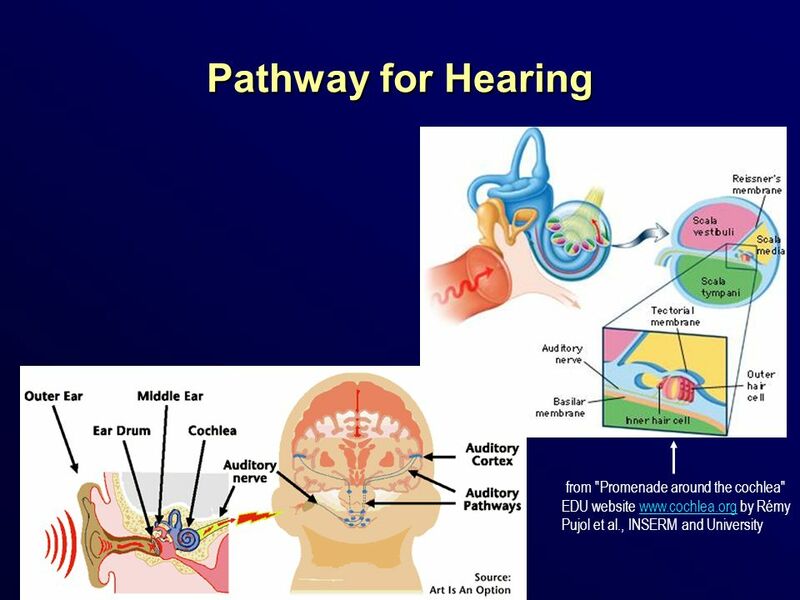 Afferent as well as efferent pathways may be involved. 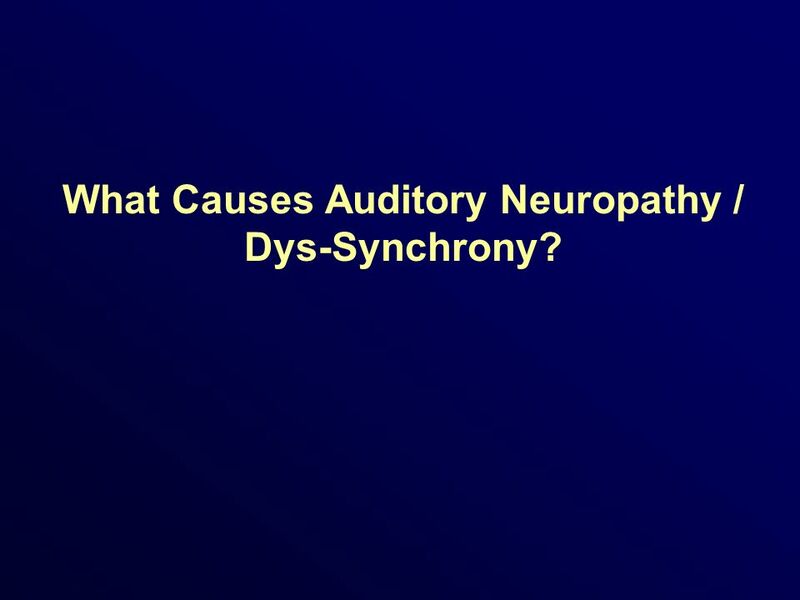 7 What Causes Auditory Neuropathy / Dys-Synchrony? 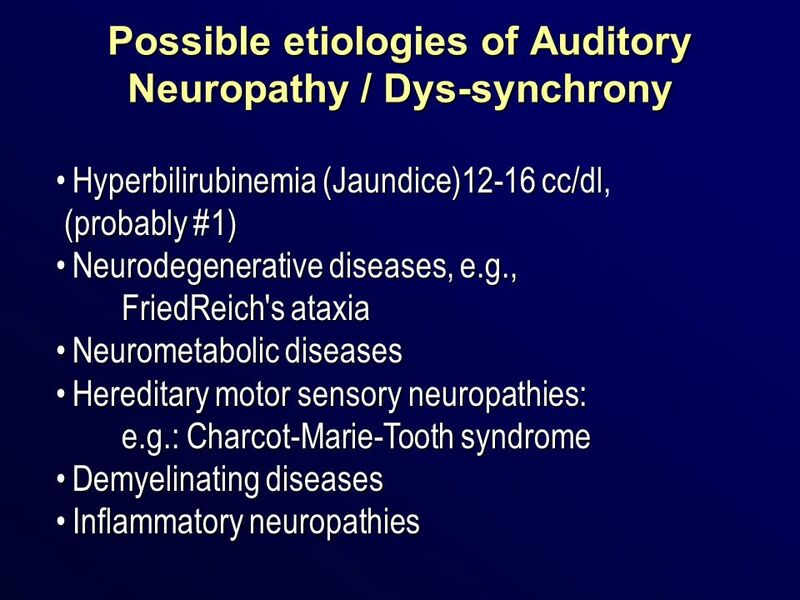 Hyperbilirubinemia (Jaundice)12-16 cc/dl, (probably #1) Neurodegenerative diseases, e.g., FriedReich's ataxia Neurometabolic diseases Hereditary motor sensory neuropathies: e.g. 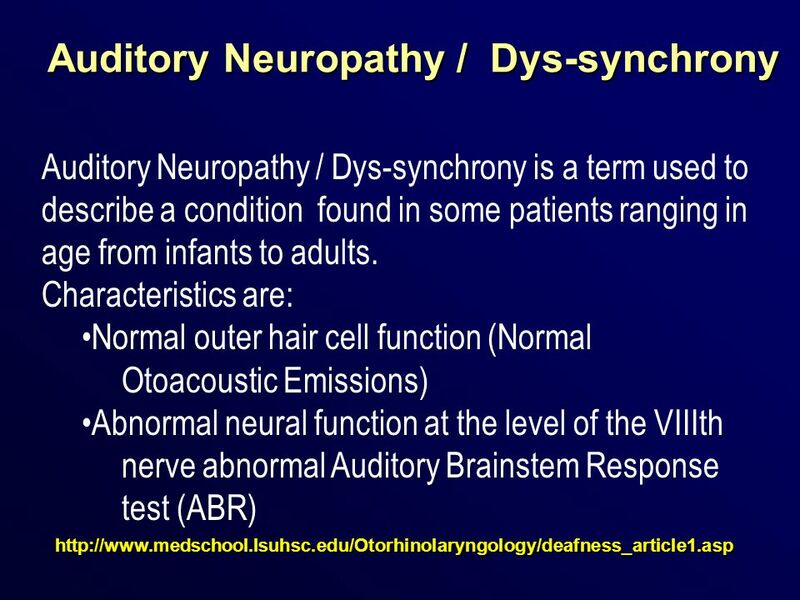 : Charcot-Marie-Tooth syndrome Demyelinating diseases Inflammatory neuropathies Several factors have been linked to an in children. 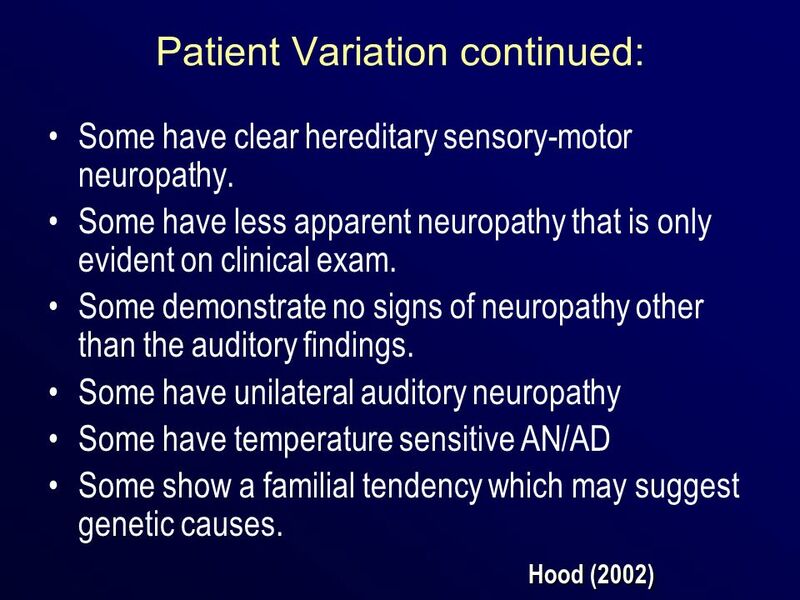 However a clear cause and effect relationship has not been proven. 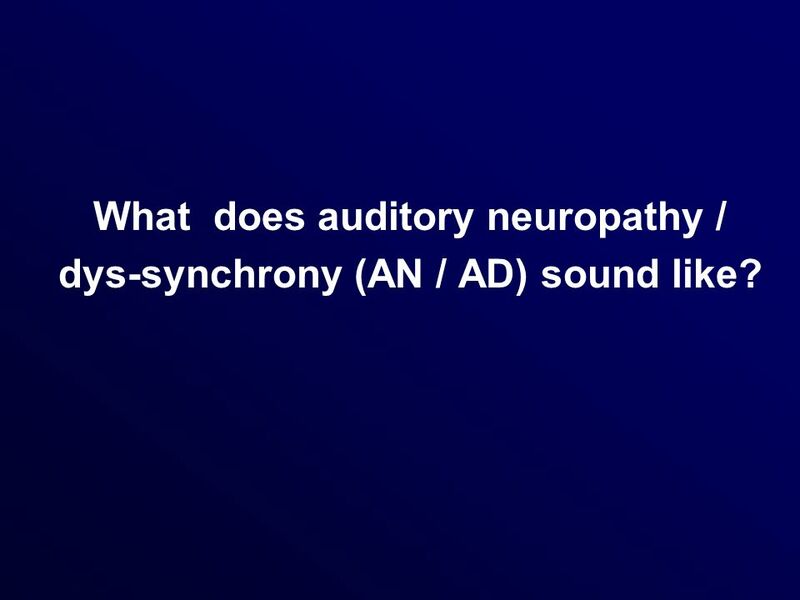 10 What does auditory neuropathy / dys-synchrony (AN / AD) sound like? 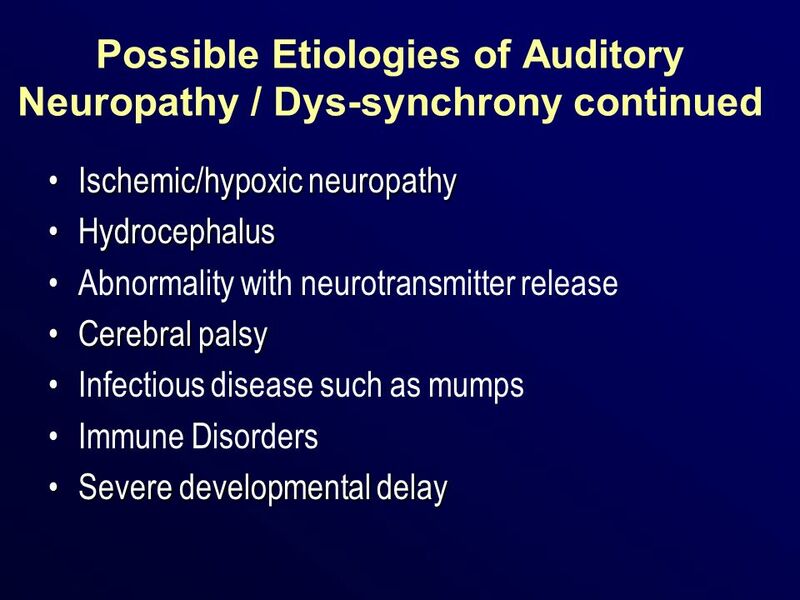 15 Are all Auditory Neuropathy / Dys-synchrony infants the same? Clearly NOT! 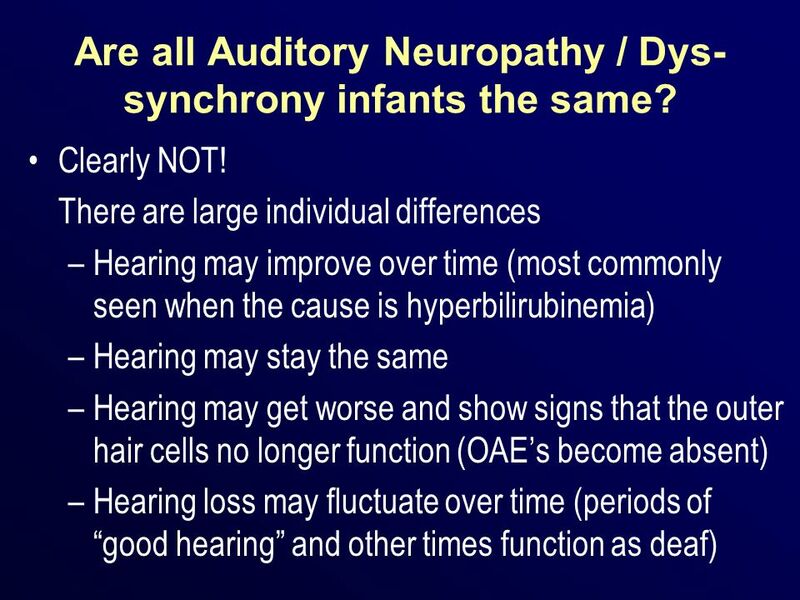 There are large individual differences Hearing may improve over time (most commonly seen when the cause is hyperbilirubinemia) Hearing may stay the same Hearing may get worse and show signs that the outer hair cells no longer function (OAE’s become absent) Hearing loss may fluctuate over time (periods of “good hearing” and other times function as deaf) In infants, both decline in hearing and improvement in auditory function have been observed (e.g., Berlin et al., 1998; Stein et al., 1996) Some newborns who display normal OAEs and absent ABRs may show improvement if neuromaturation is the underlying problem. 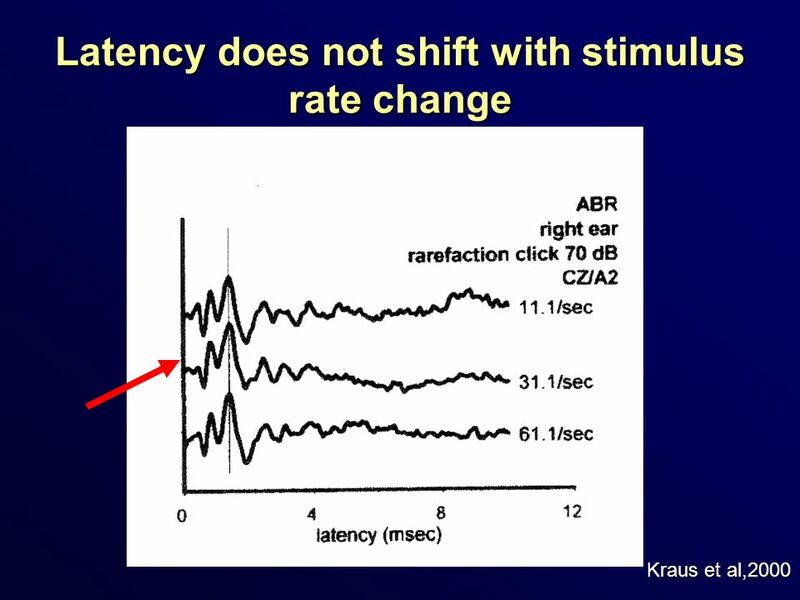 In these cases, as the neural system matures, the ABR may improve. 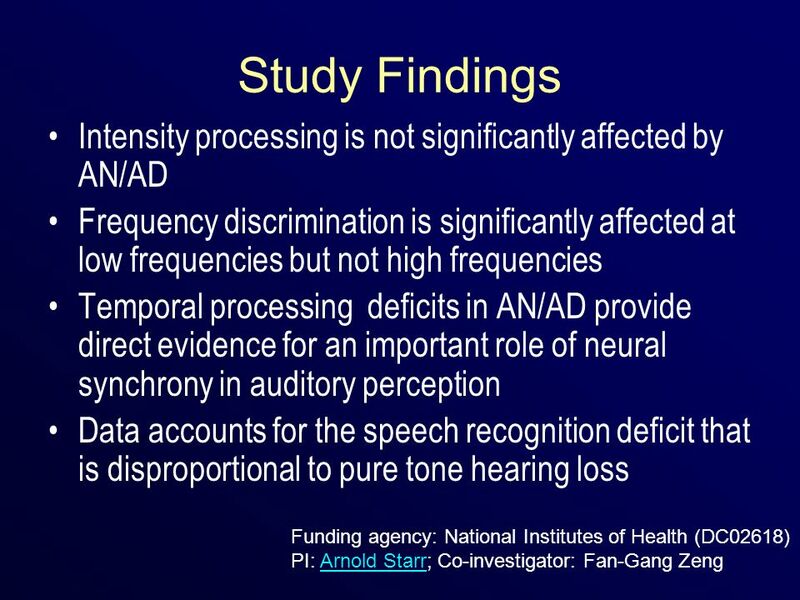 Other cases have been reported where auditory function, reflected in development of speech and language, develops over a longer period of time. 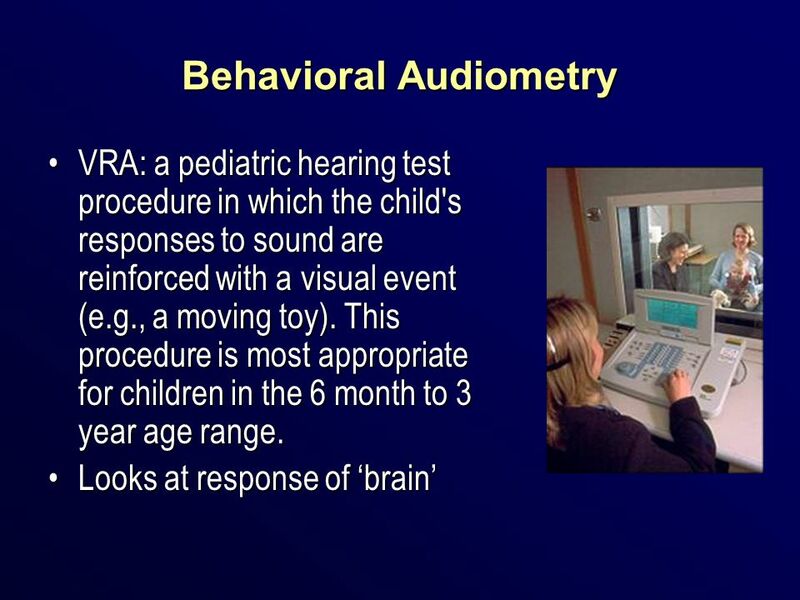 Still other infants and young children have shown a progressive decrease in auditory responsiveness. 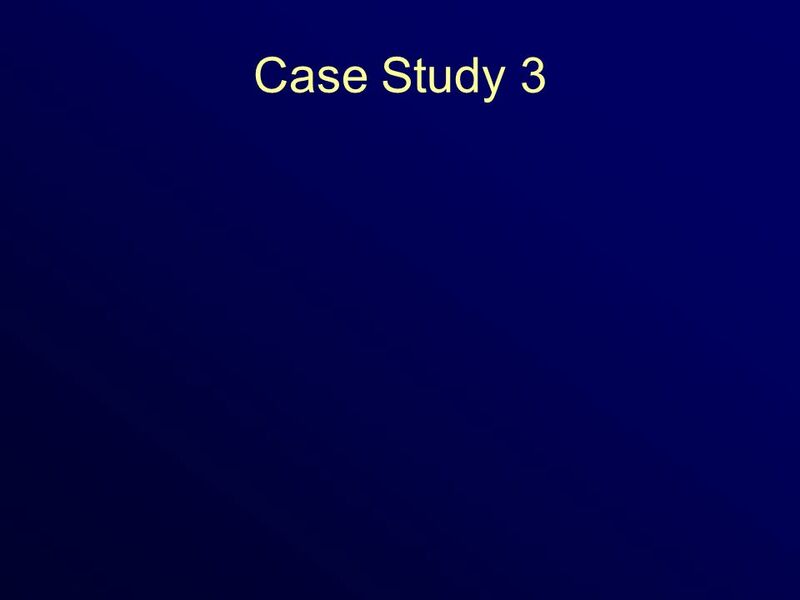 The reason for the loss over time is unclear. 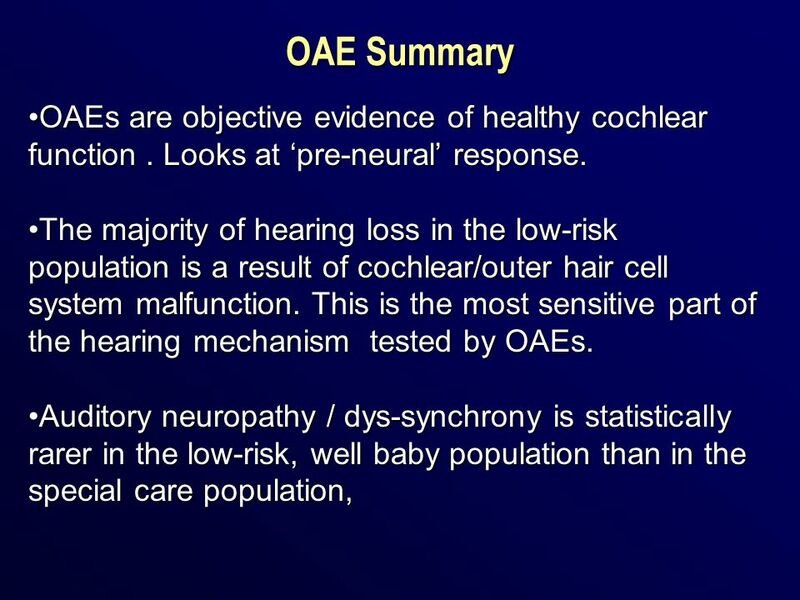 When an OAE is not present, the evidence of a CM can supplant the presence of oaes for meeting criterion of evidence of normal hair cell function.The presences of a clear cochlear microphonic can supplant the presence of OAEs for meeting the criterion of evidence of normal hair cell function. 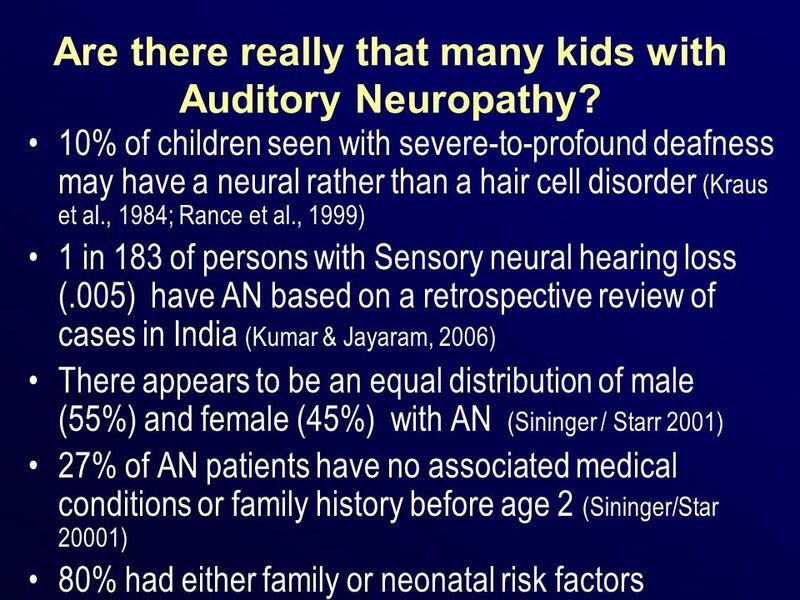 17 Are there really that many kids with Auditory Neuropathy? 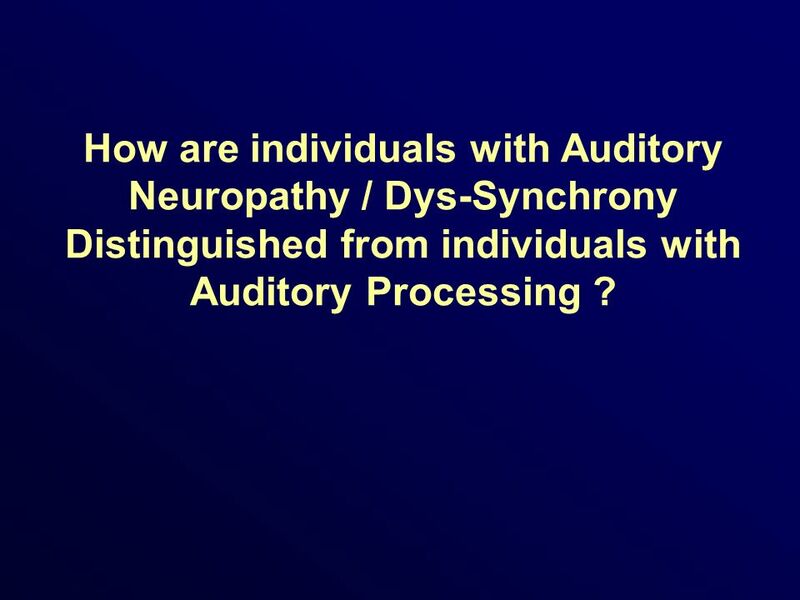 18 How are individuals with Auditory Neuropathy / Dys-Synchrony Distinguished from individuals with Auditory Processing ? 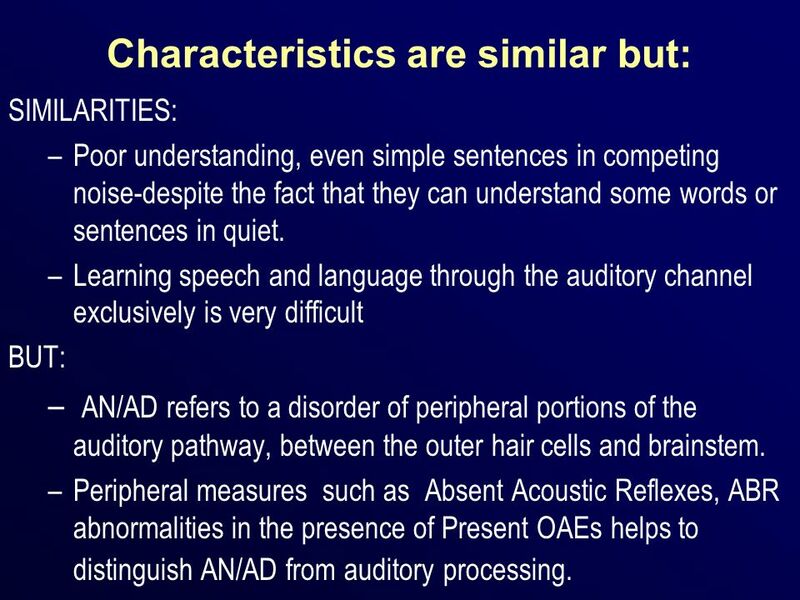 SIMILARITIES: Poor understanding, even simple sentences in competing noise-despite the fact that they can understand some words or sentences in quiet. 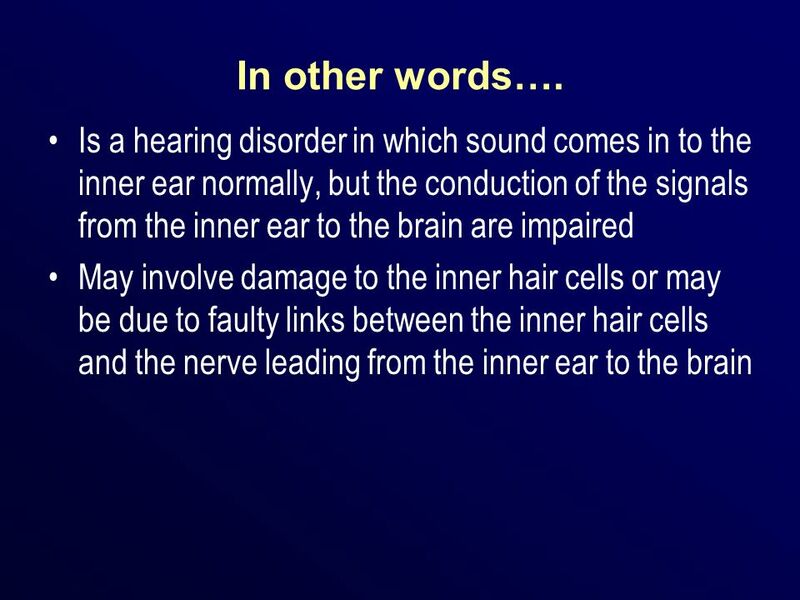 Learning speech and language through the auditory channel exclusively is very difficult BUT: AN/AD refers to a disorder of peripheral portions of the auditory pathway, between the outer hair cells and brainstem. 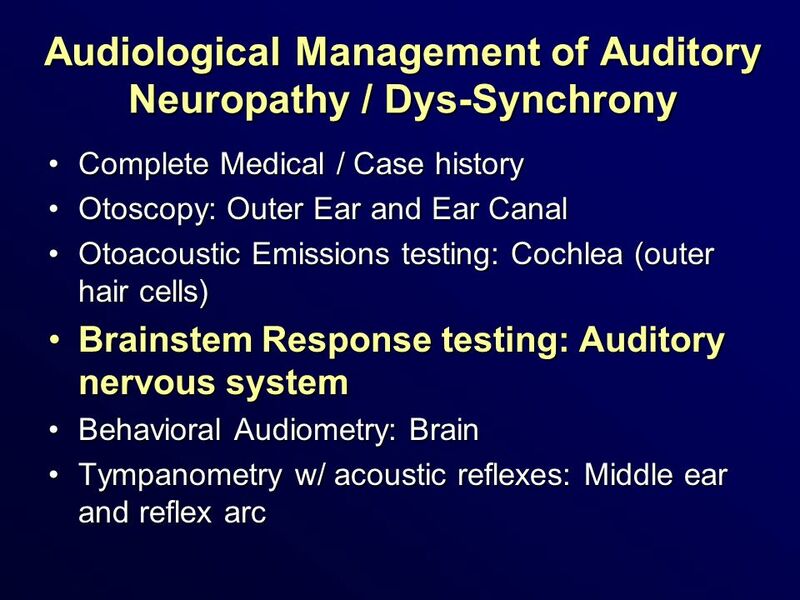 Peripheral measures such as Absent Acoustic Reflexes, ABR abnormalities in the presence of Present OAEs helps to distinguish AN/AD from auditory processing. 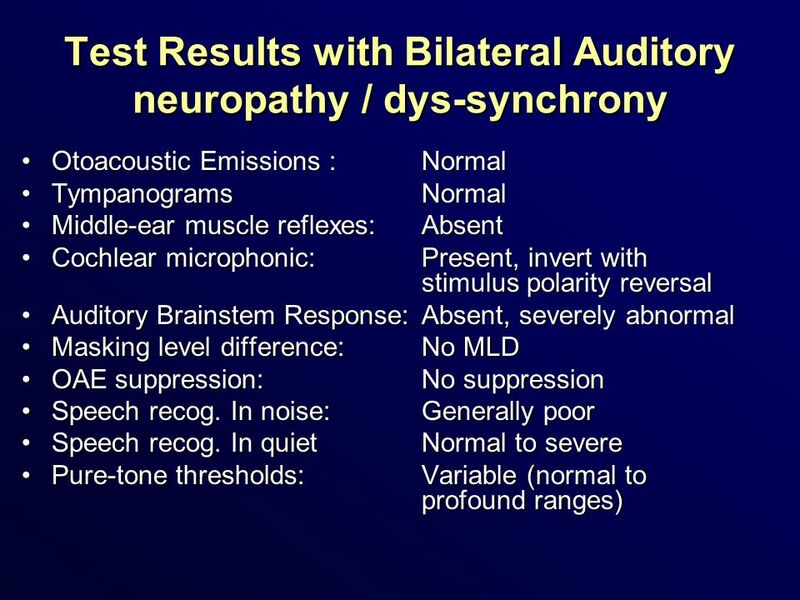 Patient must have difficulty hearing in at least some situations or for some stimuli regardless of Pure tone threshold Must have elevated or absent auditory brain-stem reflexes, abnormal ABR Most patients with AN demonstrate the presence of OAE, but a small percentage do not A CM is also evidence of normal hair cell function and can be substituted for a normal OAE in the diagnosis of ANOne or the other must be seen to make the diagnosis of AN. 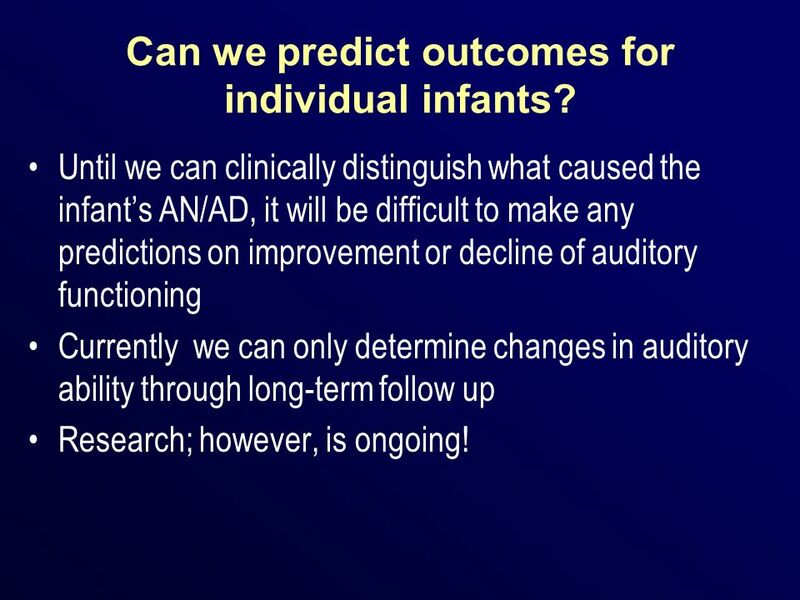 20 Can we predict outcomes for individual infants? 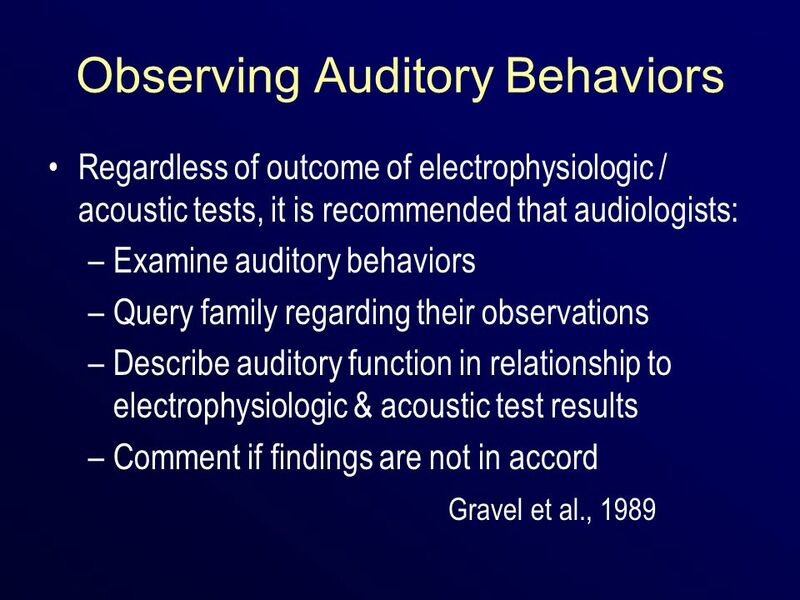 Until we can clinically distinguish what caused the infant’s AN/AD, it will be difficult to make any predictions on improvement or decline of auditory functioning Currently we can only determine changes in auditory ability through long-term follow up Research; however, is ongoing! 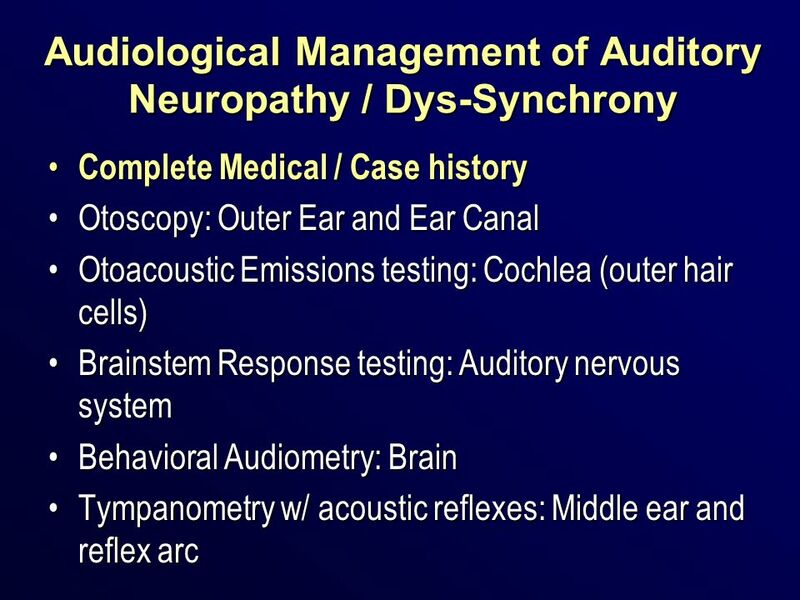 We currently can only determine changes in auditory ability through long-term follow up. 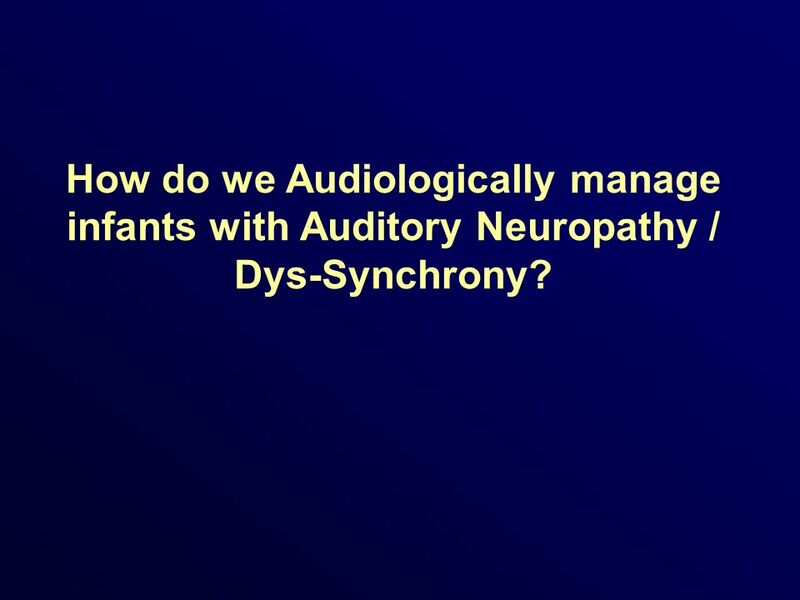 21 How do we Audiologically manage infants with Auditory Neuropathy / Dys-Synchrony? 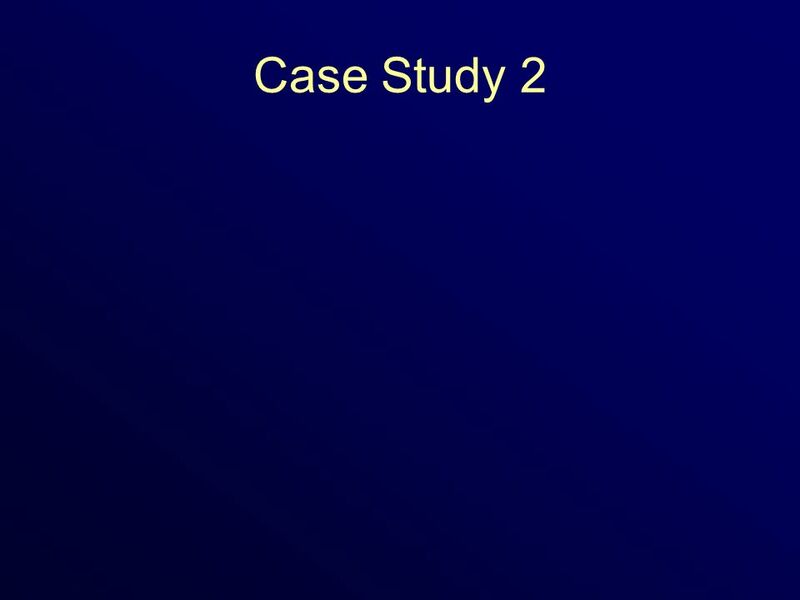 24 Why is Case History so important? 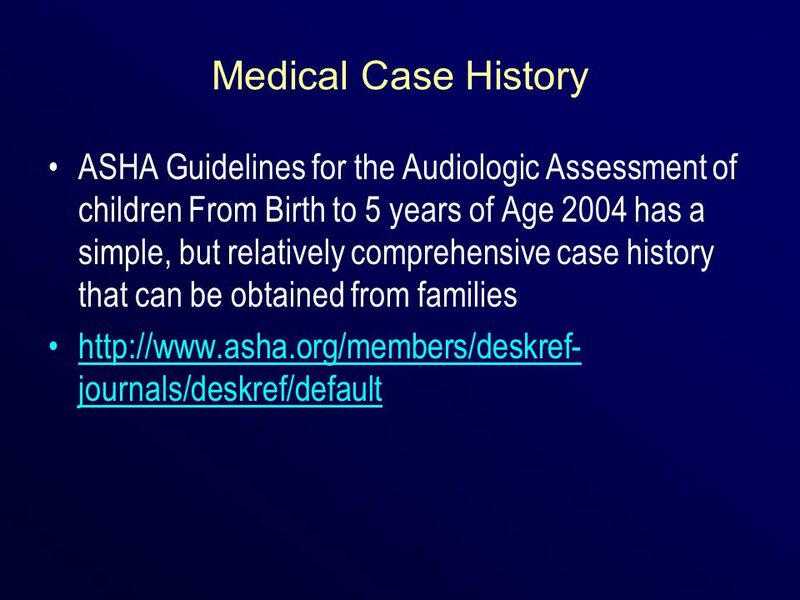 Provides information about medical complications prior to birth, during birth and after birth. 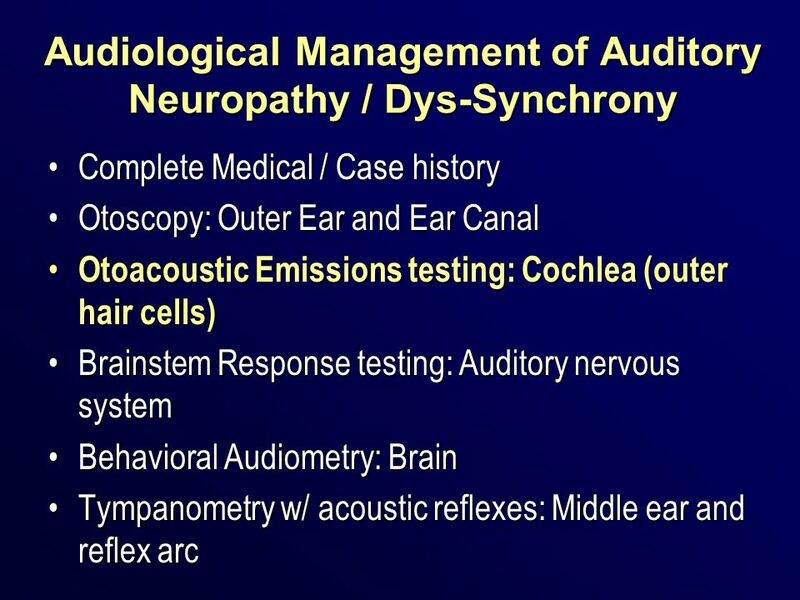 Provides invaluable information regarding risk indicators for progressive or late onset hearing loss .(i.e. 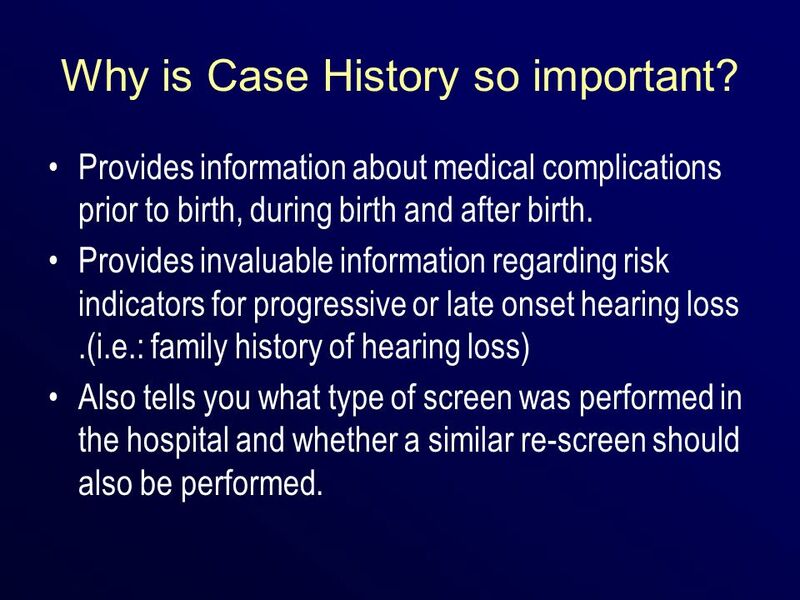 : family history of hearing loss) Also tells you what type of screen was performed in the hospital and whether a similar re-screen should also be performed. 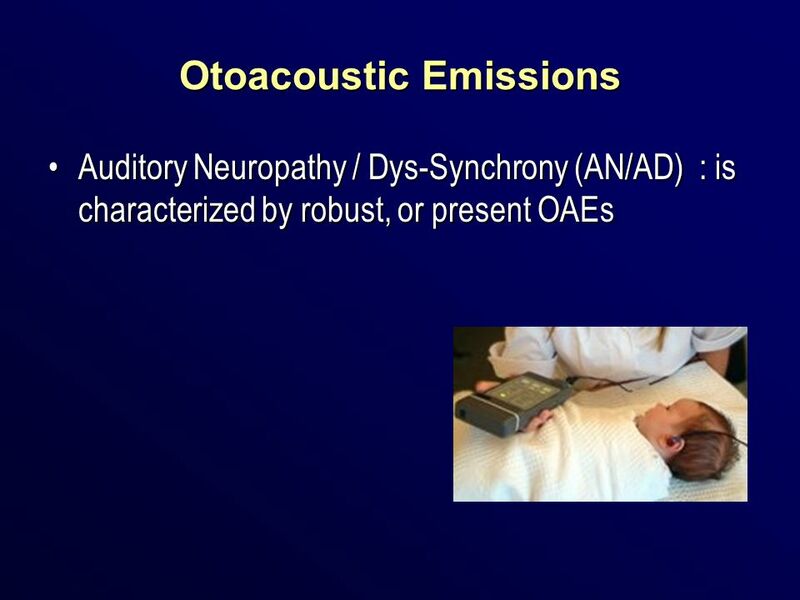 If an infant was in the NICU, you would want to know if an OAE or an ABR was performed, did they pass or refer, and if a repeat OAE or ABR would be appropriate. 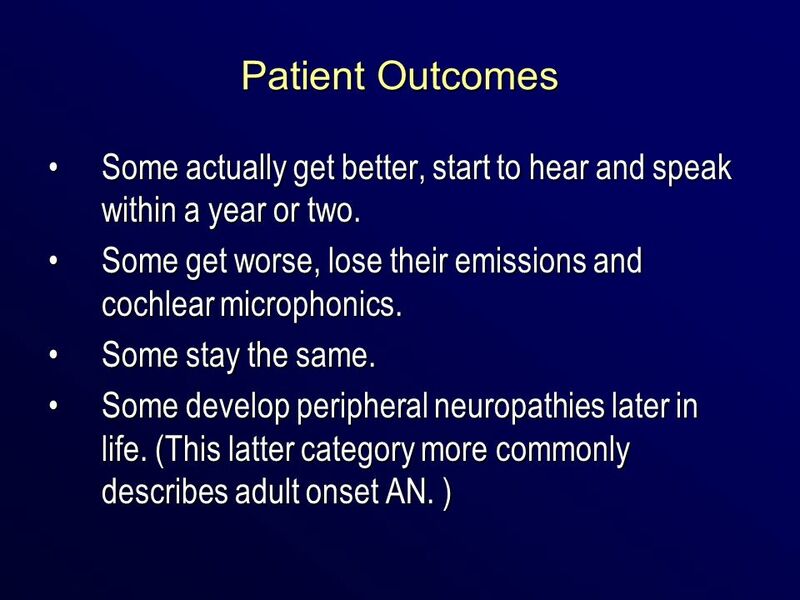 AN/AD kids greatest prevalence is from the NICU due to complications with birth. 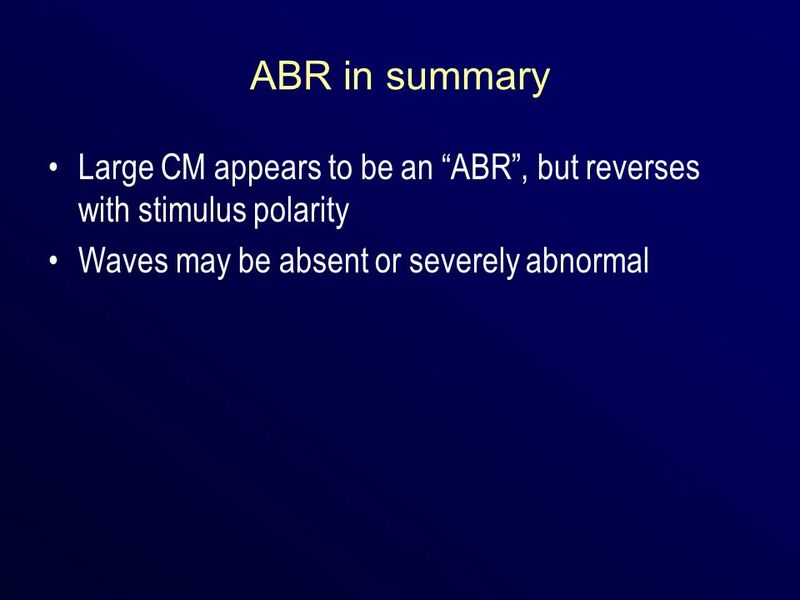 However, if a child was not responding to sound and had Hyperbilirubinemia at birth, this may raise some red flags. 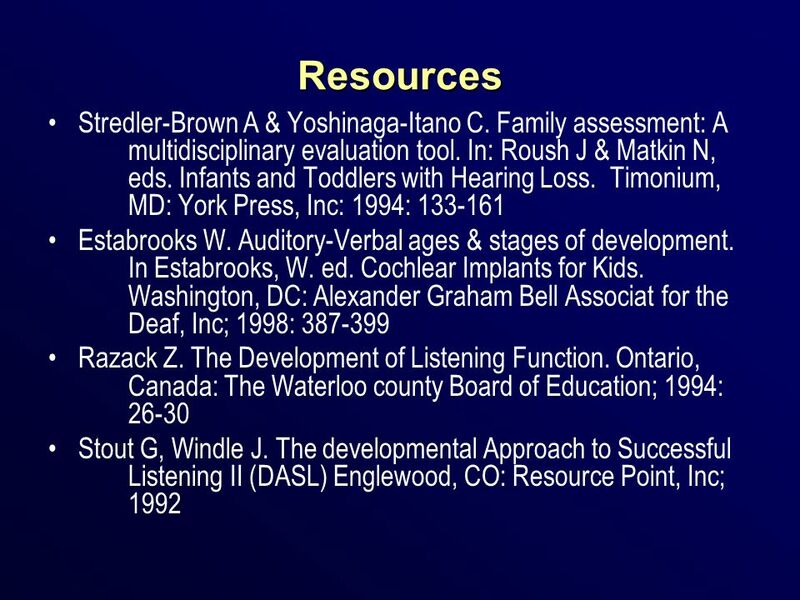 Also important to know family history of hearing loss. 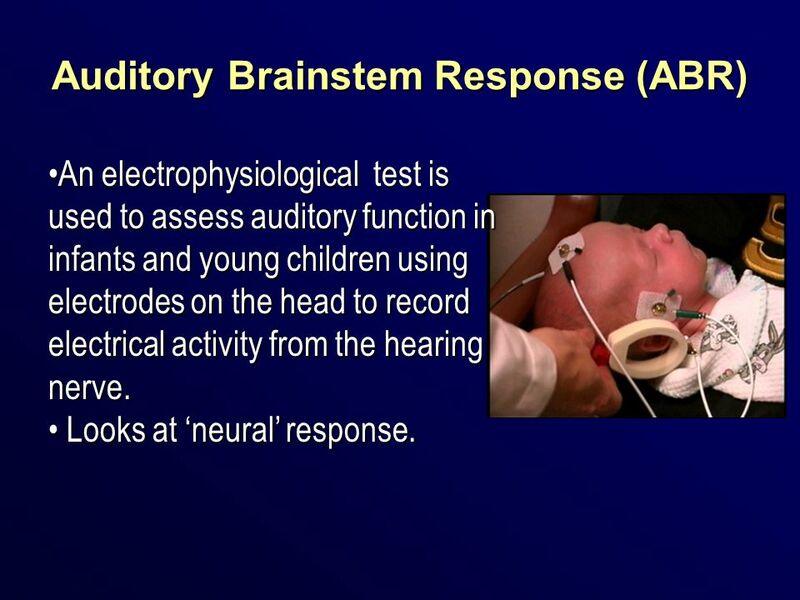 An electrophysiological test is used to assess auditory function in infants and young children using electrodes on the head to record electrical activity from the hearing nerve. 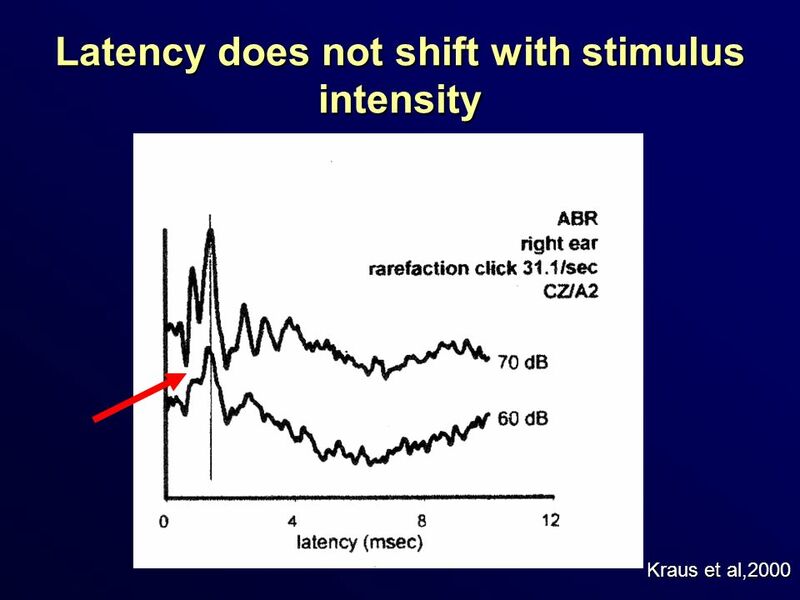 Looks at ‘neural’ response. 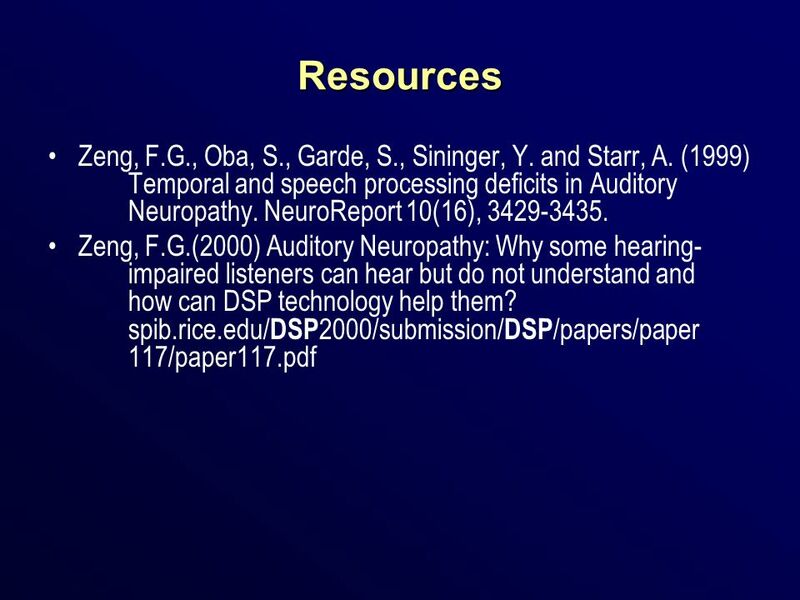 Provide up-to-date information regarding the present understanding of AN, this is important in making decisions. 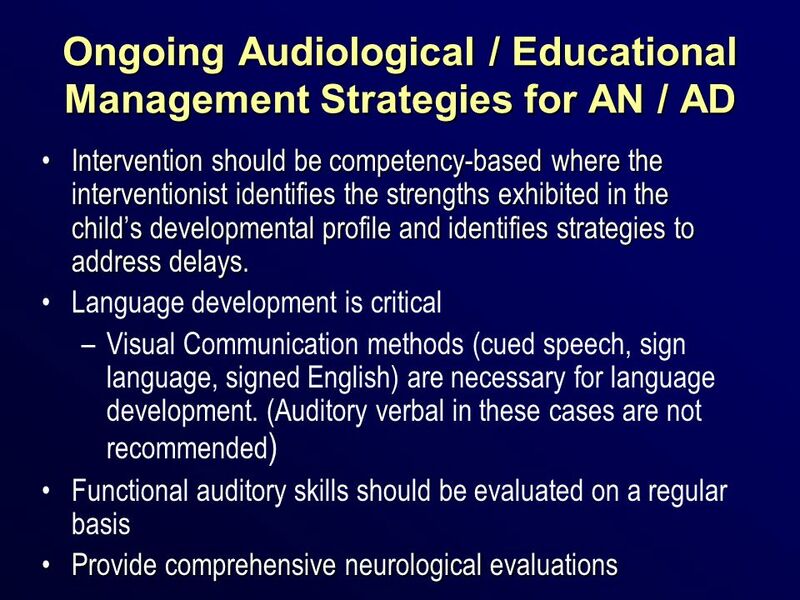 Parents and Educators Children with AN/AD should have access to appropriate early intervention and/or education programs. 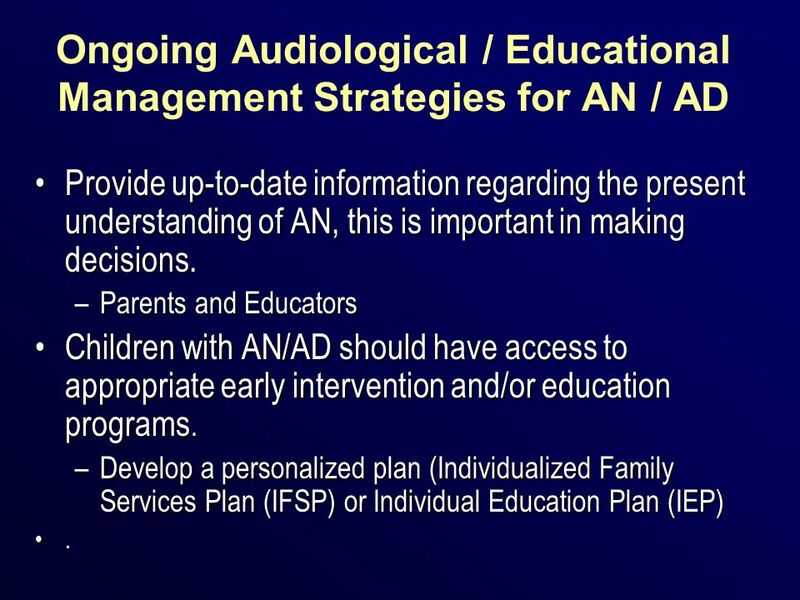 Develop a personalized plan (Individualized Family Services Plan (IFSP) or Individual Education Plan (IEP) . 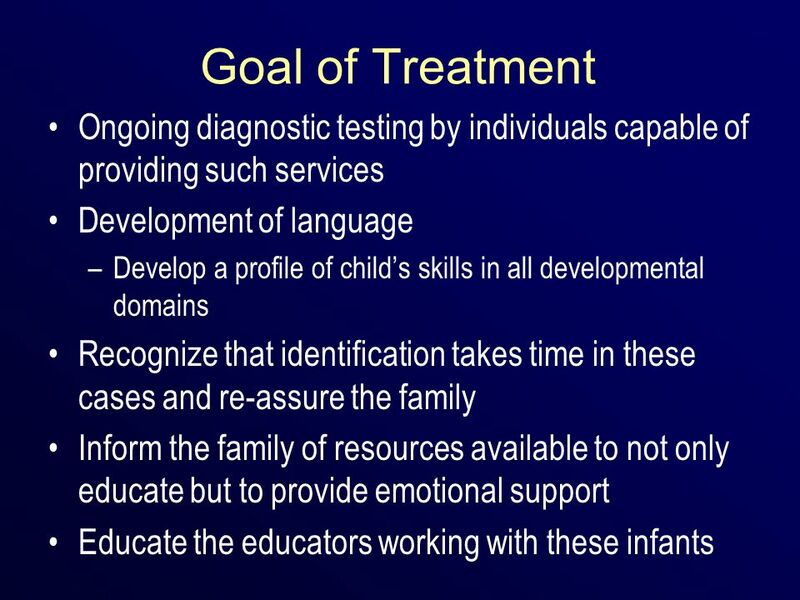 While the intent of each child’s individualized family services plan or individual education plan is to create a personalized plan, children with AN/AD often challenge the system because in many situation, the professionals are unfamiliar with the diagnosis. 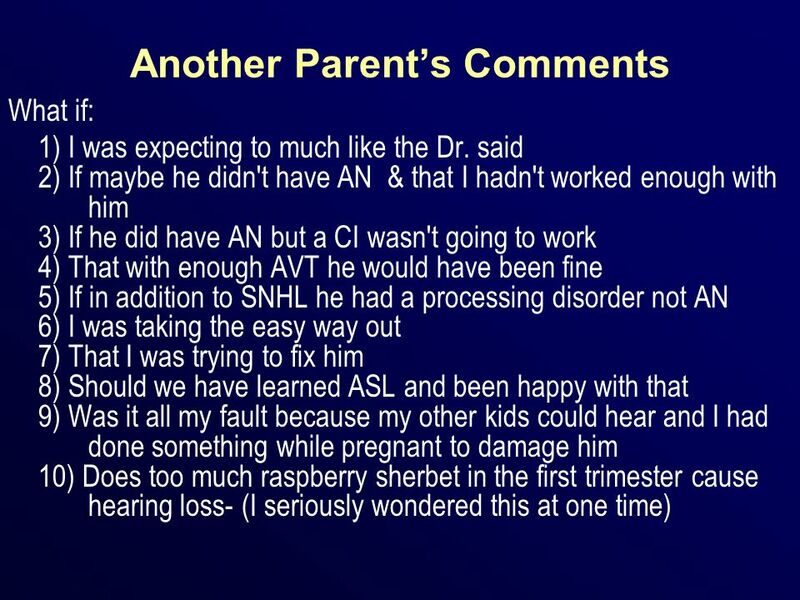 53 How can the professional be more supportive of parents? 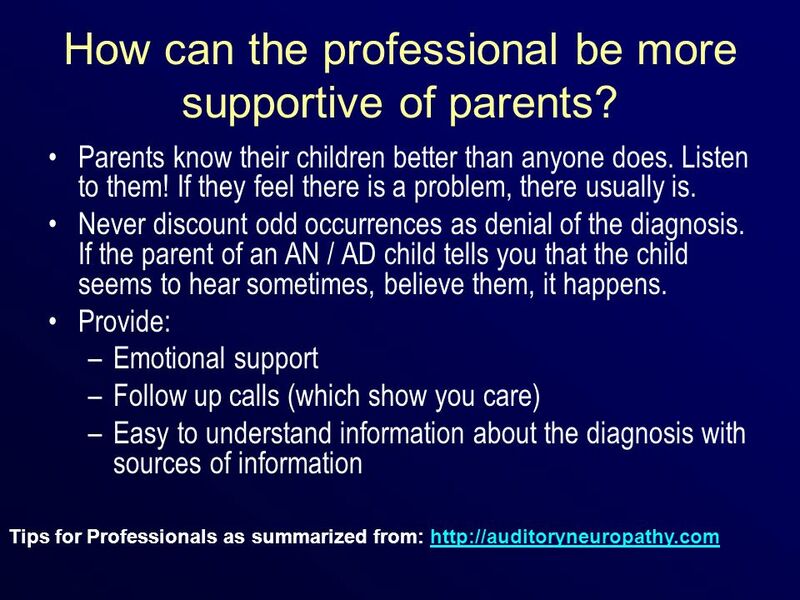 54 How can the professional be more supportive of parents? 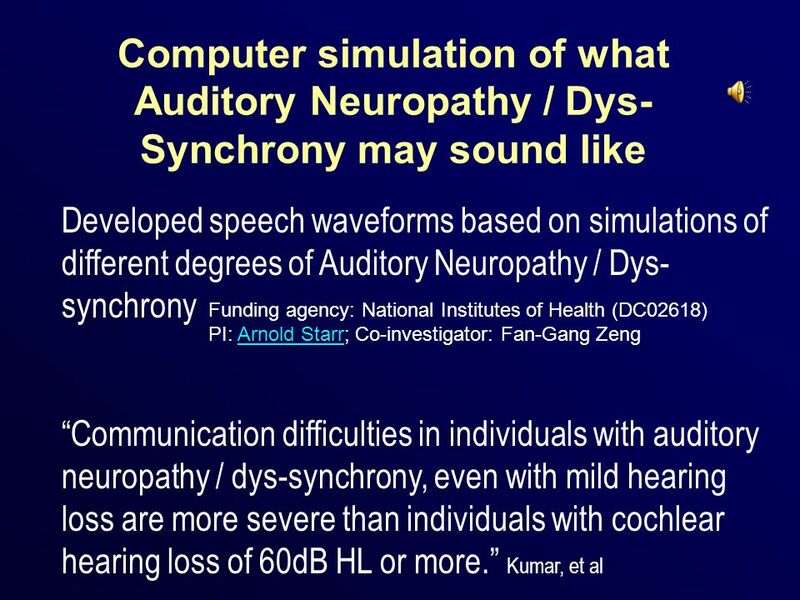 Provide sources of information on all communication choices and available intervention services in your area Direct them to other families, support groups, internet loops and websites dealing with the diagnosis, conferences, seminars, etc. 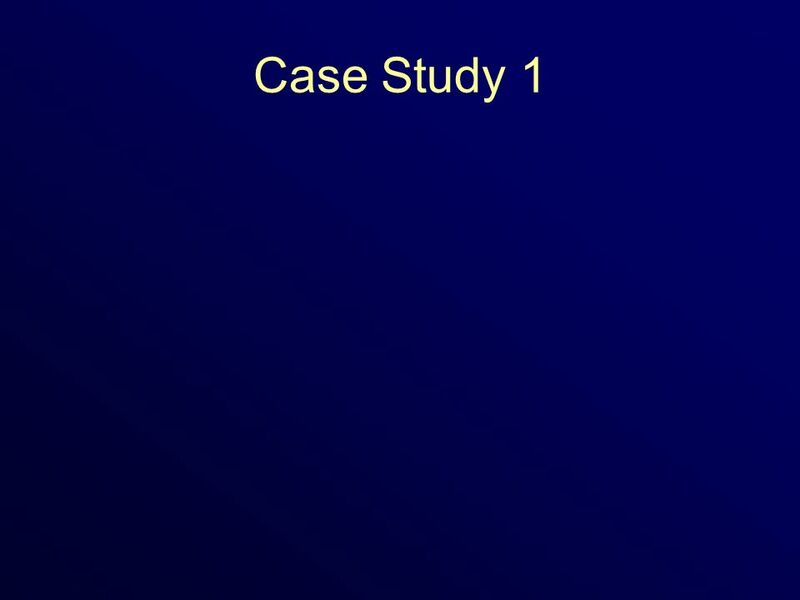 Be honest if a question is outside your knowledge base. 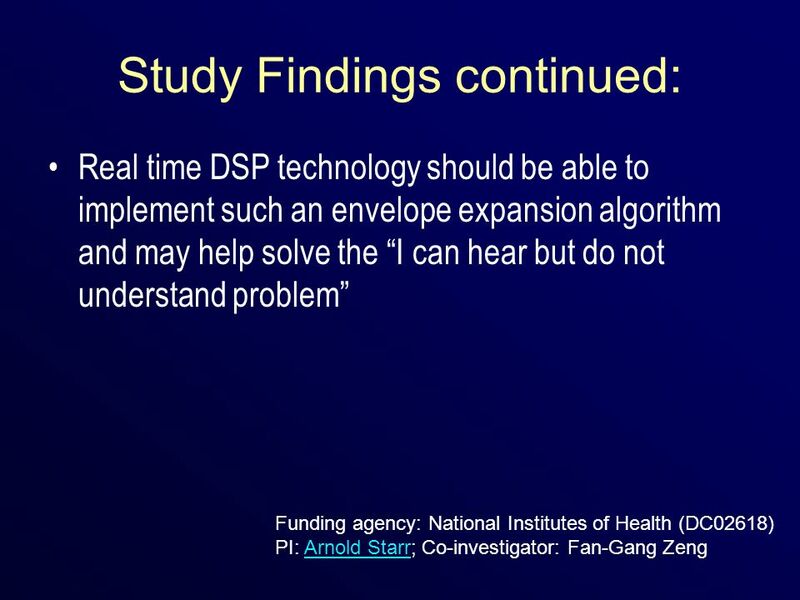 It is ok to say “I don’t know, but I will find out”, and then find out! 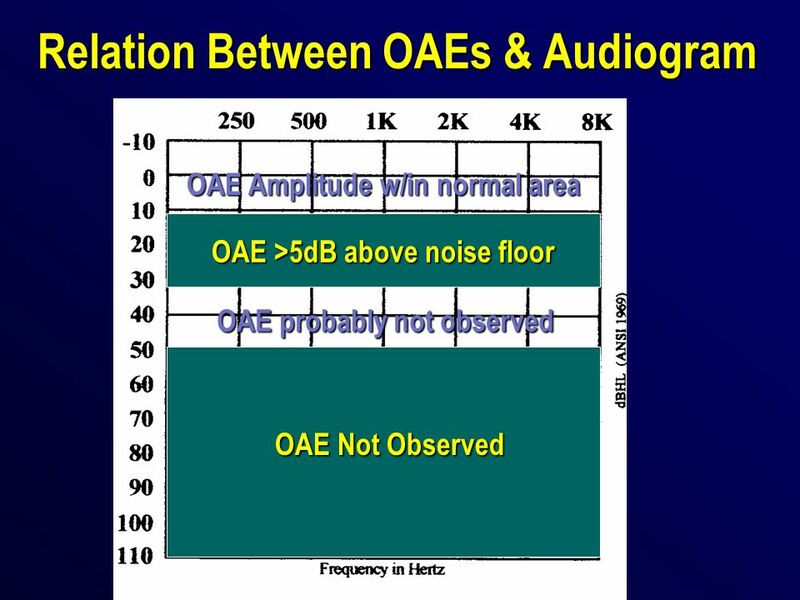 Stay current in your field. Be a team player! 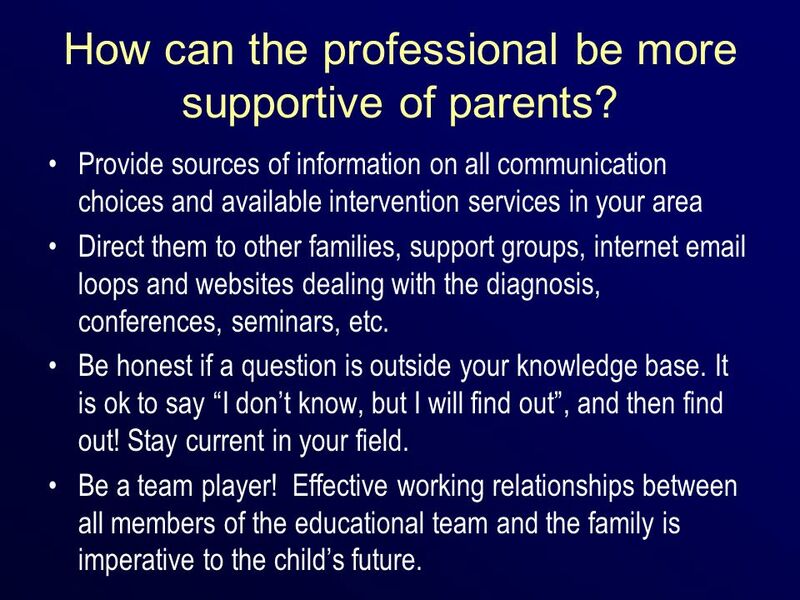 Effective working relationships between all members of the educational team and the family is imperative to the child’s future. 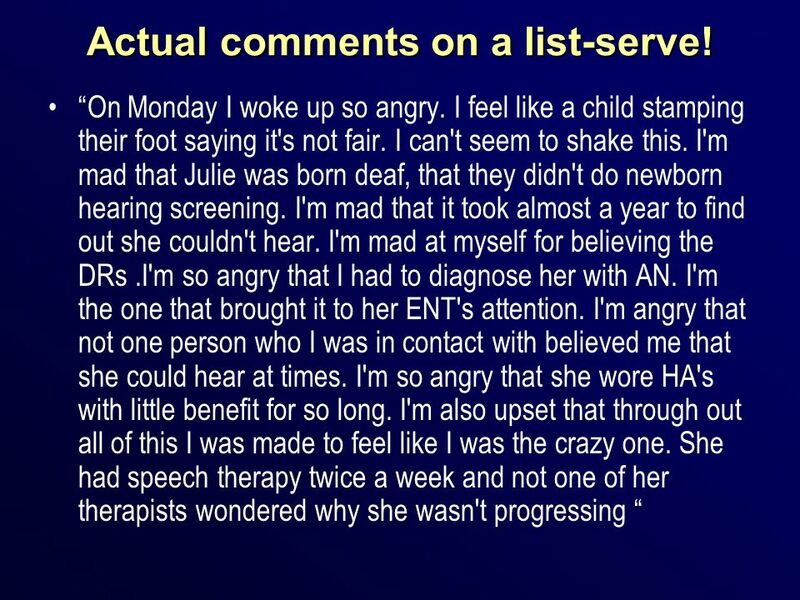 58 Actual comments on a list-serve! 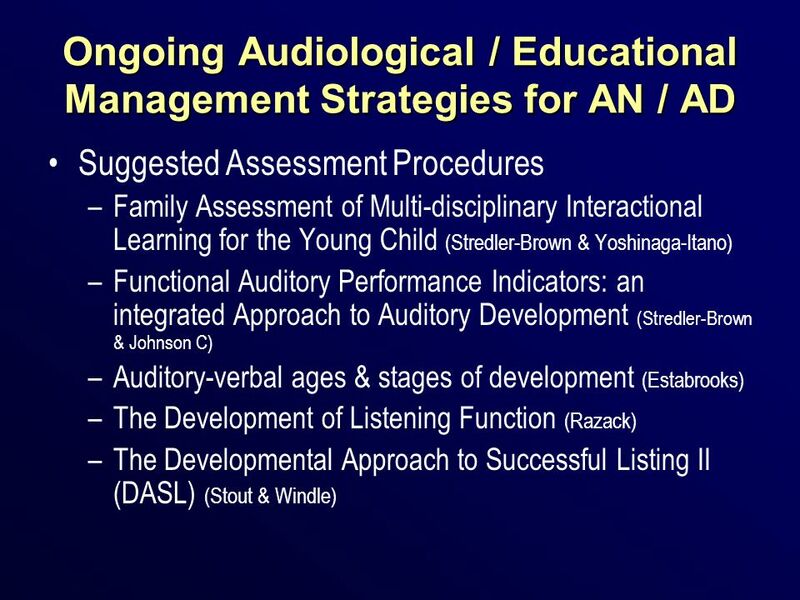 Parents need the professionals to be educated. 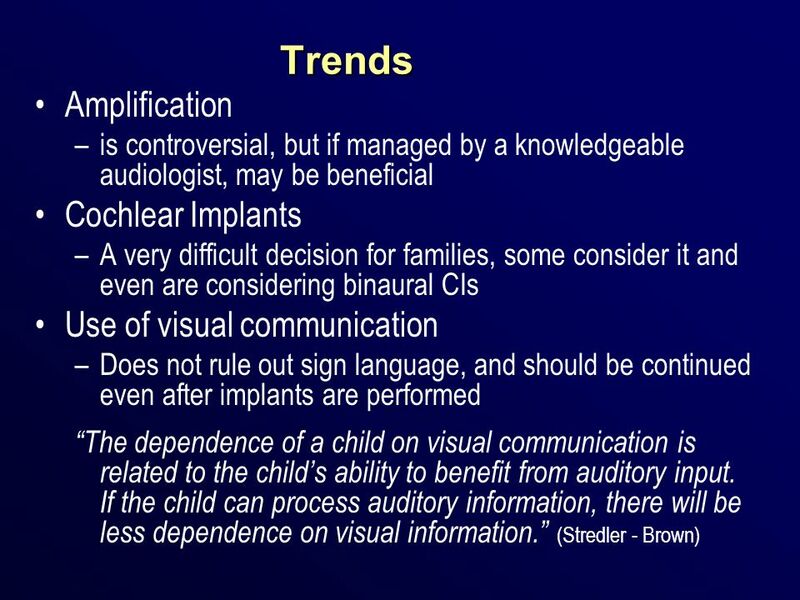 Professionals need to be understanding of the mixed signals parents are given. 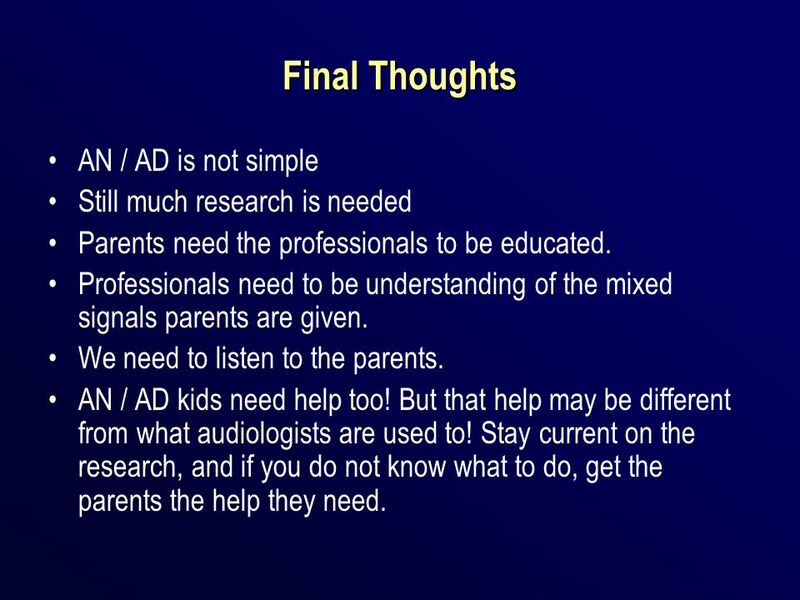 We need to listen to the parents. 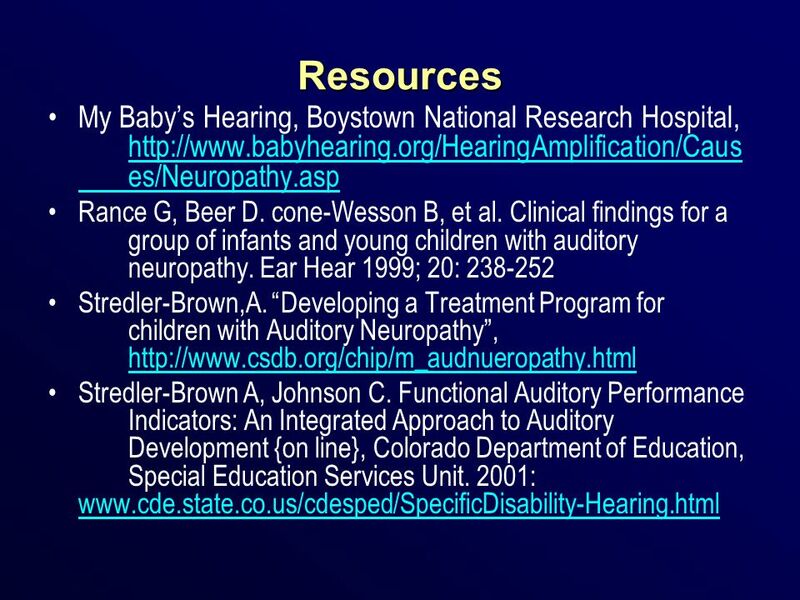 AN / AD kids need help too! 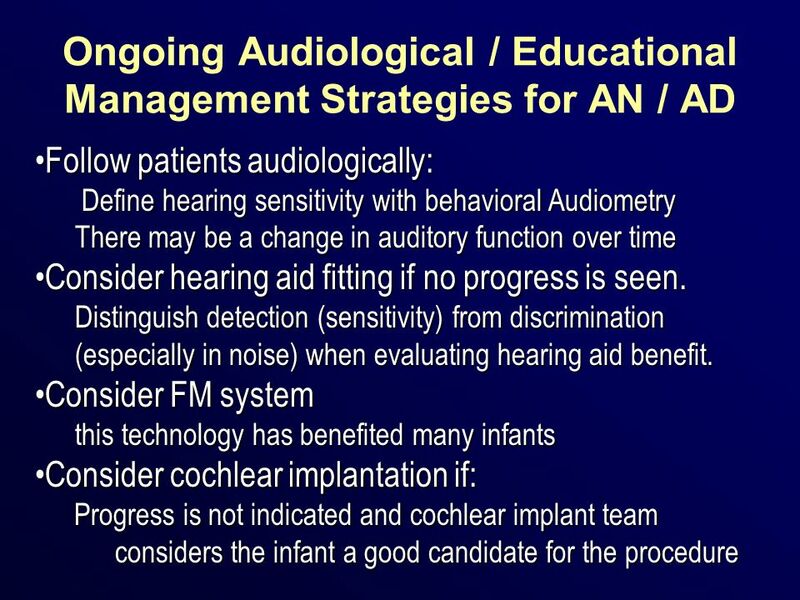 But that help may be different from what audiologists are used to! 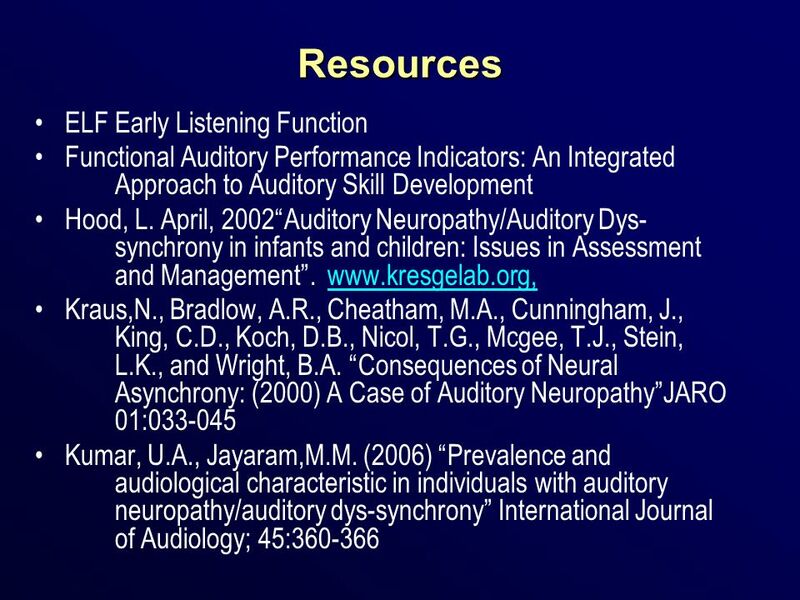 Stay current on the research, and if you do not know what to do, get the parents the help they need. 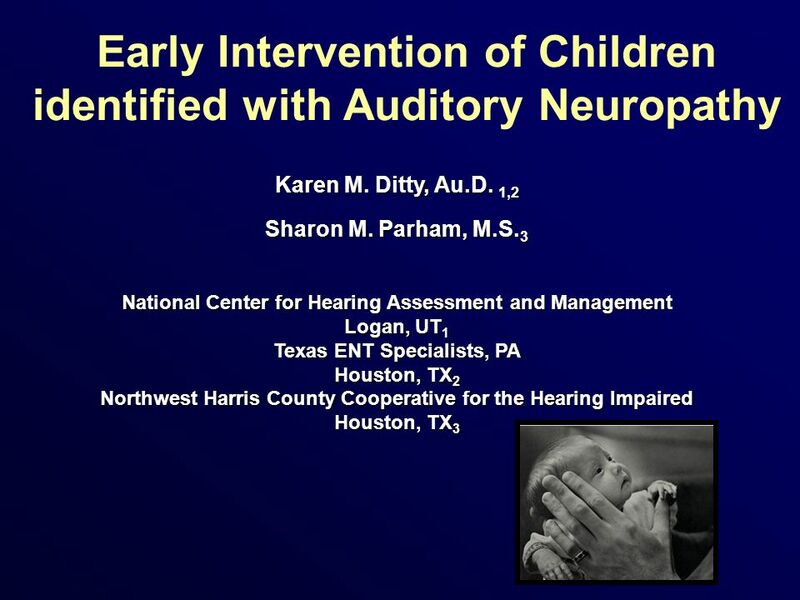 Download ppt "Early Intervention of Children identified with Auditory Neuropathy"
Connecting with Appropriate Early Intervention Programs Antonia Brancia Maxon, Ph.D New England Center for Hearing Rehabilitation. 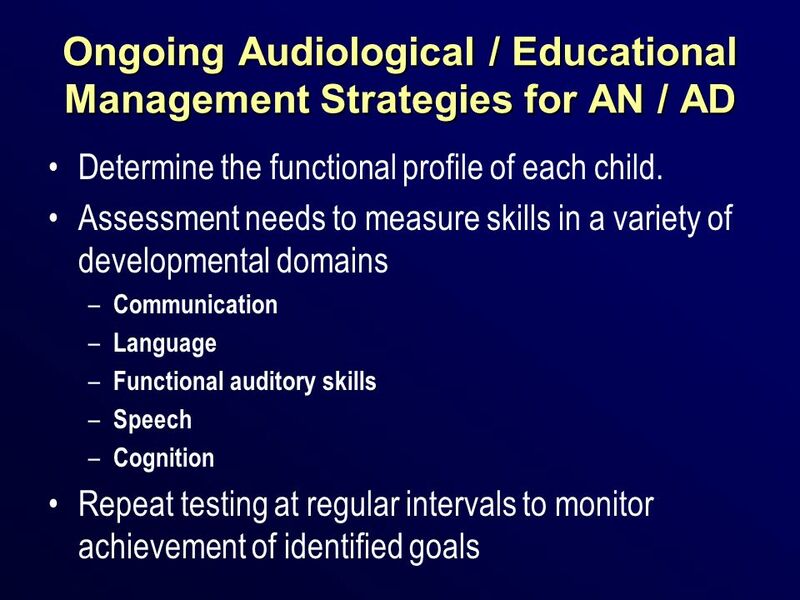 Can you explain my child’s Audiological Report? 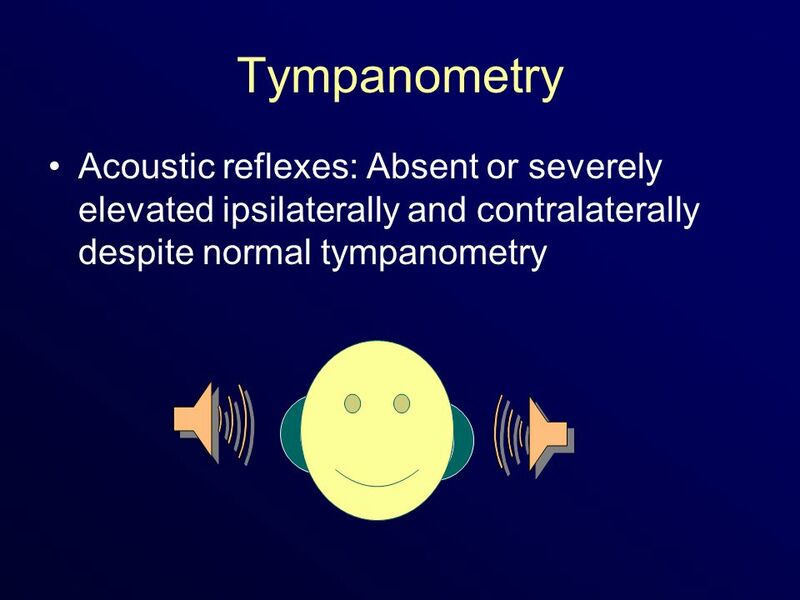 Extremely low gestation infants are at high risk for auditory neuropathy Lynn M. Iwamoto, MD; Konstantine Xoinis, MD; Yusnita Weirather, MA, CCC-A; Hareesh. 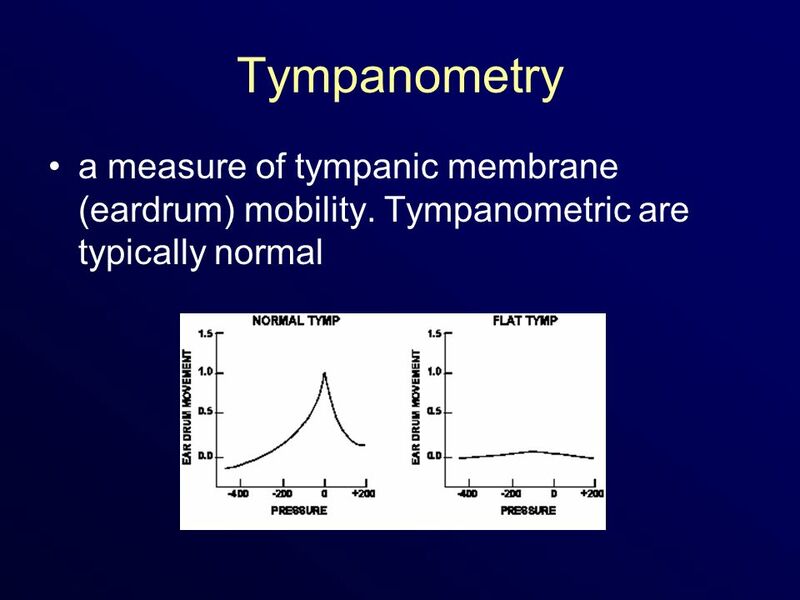 Antonia Brancia Maxon, Ph.D. Texas ENT Specialists, P.A. 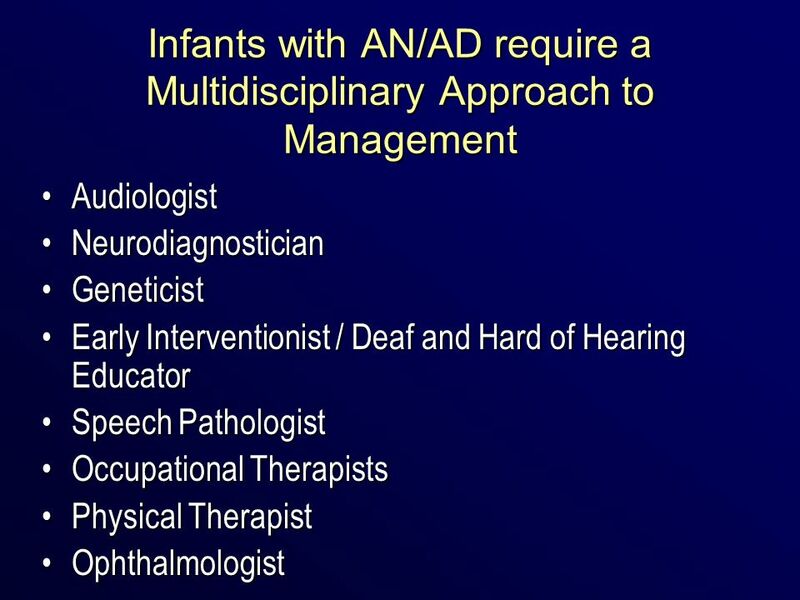 The Ethics of Serving Infants and Their Families Les R. Schmeltz, Au.D. 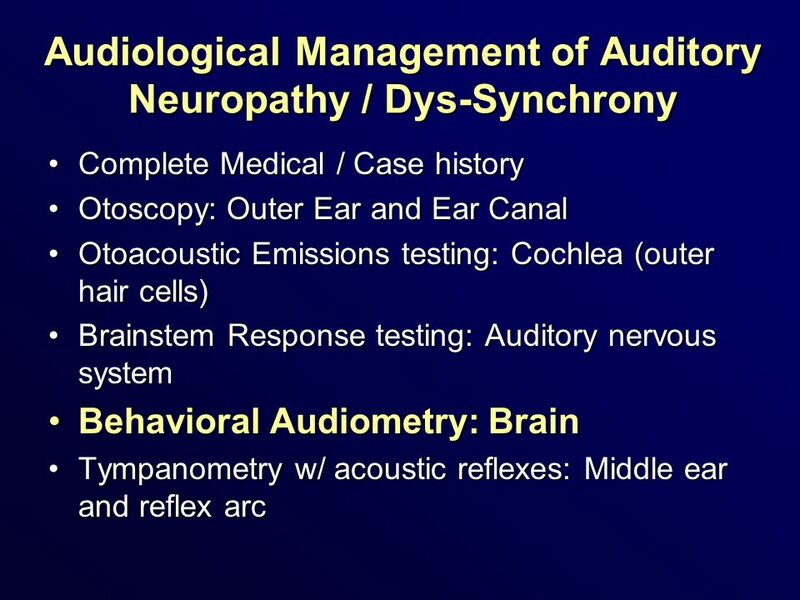 NCHAM & Arizona School of Health Sciences Karen Munoz, M.S. 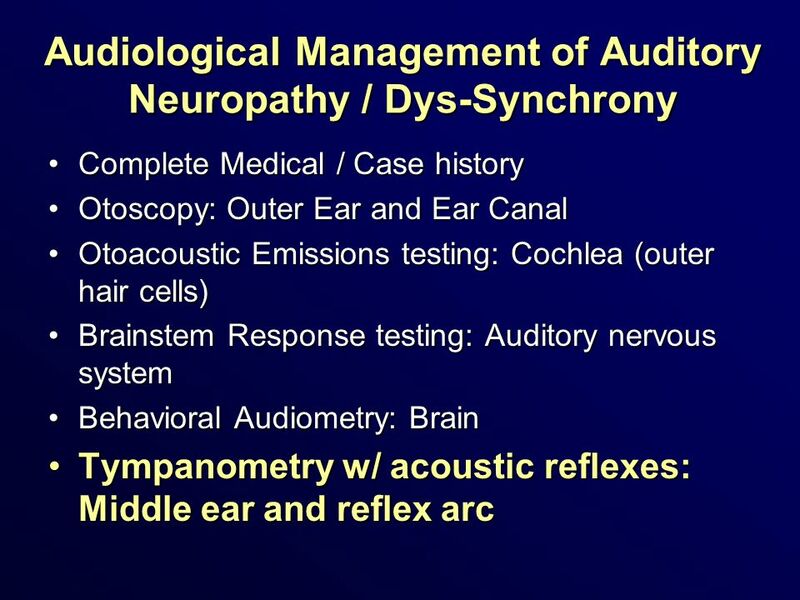 NCHAM & Northern Illinois. 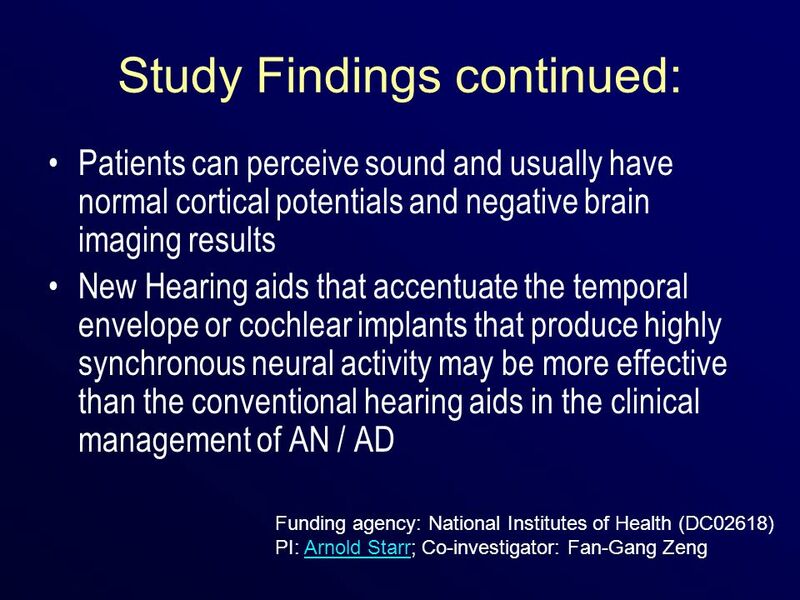 The Use of Ultrasonic Bone Conduction to Treat Tinnitus Josh Vicari July 23, 2007. 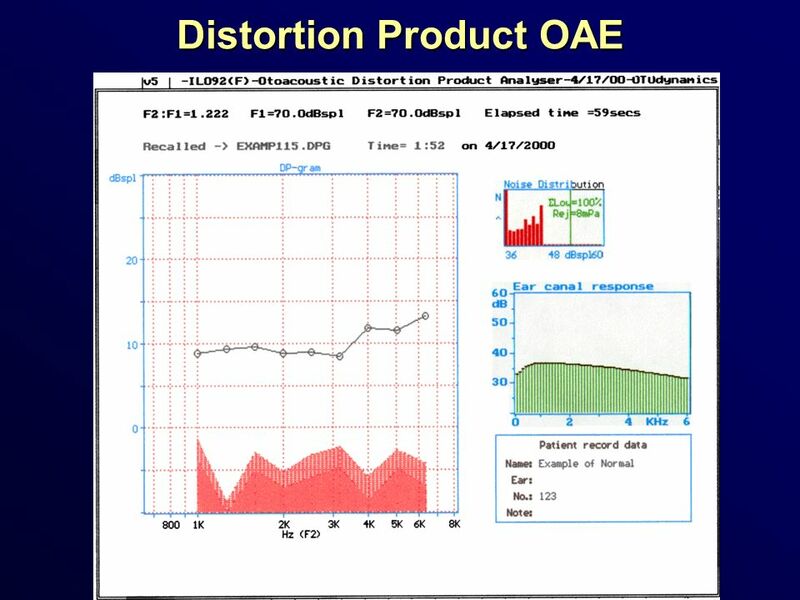 HEARING WELL CLUB WHAT DOES YOUR AUDIOGRAM SAY ABOUT HEARING LOSS? 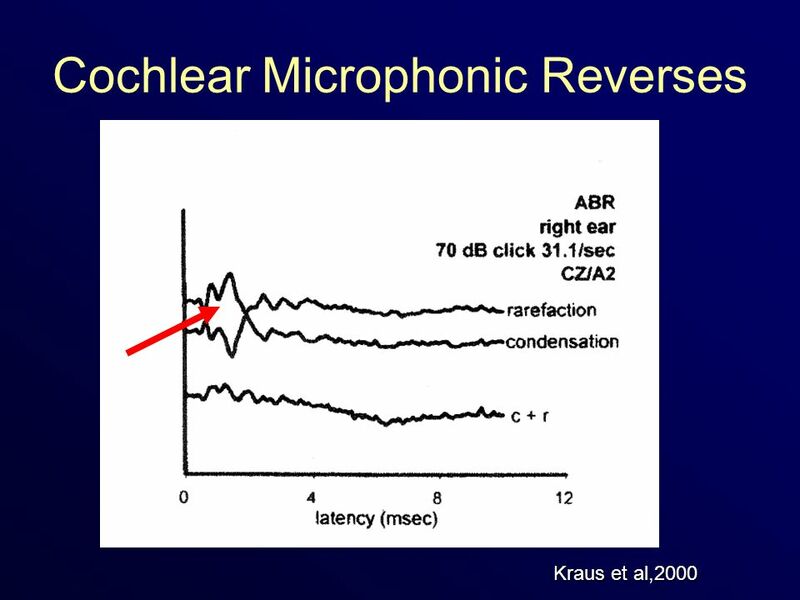 Cochlear Functions Transduction- Converting acoustical- mechanical energy into electro-chemical energy. 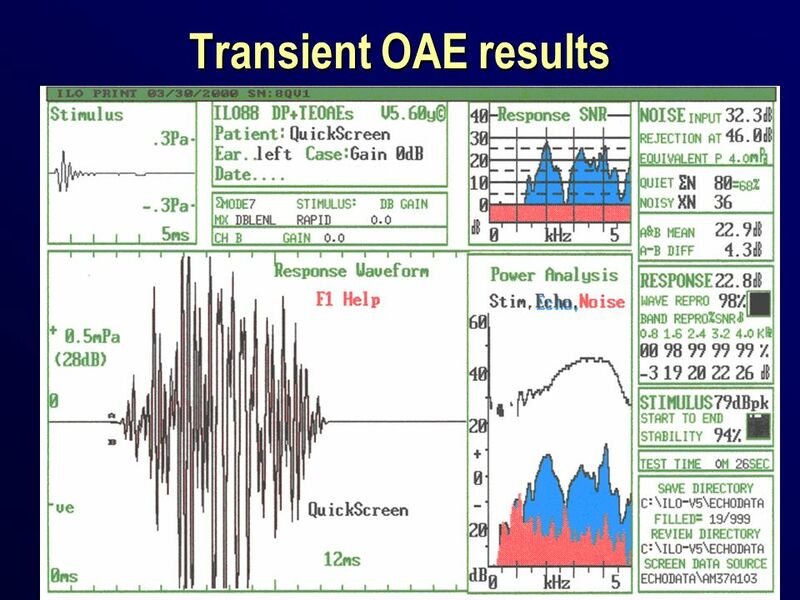 Frequency Analysis-Breaking sound up.